The name says it all: HS-T- Hunting Shooting Tactical. This riflescope combines two of Vortex’s most popular riflescope models; the Viper HS and the Viper PST models, to give you an unrivaled and feature-rich firearm attachment. Whether you are shooting ARs or bolt guns, or perched on mountain tops or tree stands, the Viper HS-T guarantees optimized performance for all of your shooting applications. So what features makes this riflescope so great? Why should you purchase it for your next hunting, shooting, or tactical engagement? The answer is simple. The Vortex Viper HS-T is composed of professional grade construction and an optical system like no other, so that you can have maximum versatility and performance each and every time your head outdoors. Furthermore, the riflescope ensures that you experience fast-target acquisition, fantastic precision, easy operation, and heightened versatility, so that you can get your target each and every time. 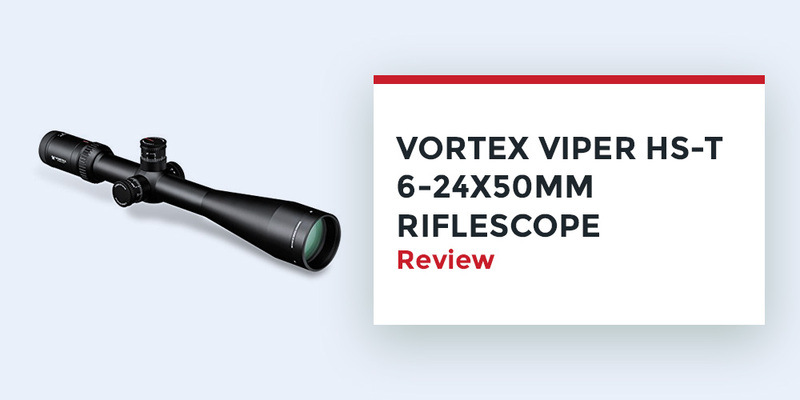 Looking for an investment that will make your long range engagements extremely worthwhile, then read the comprehensive Vortex Viper HS-T review below. Top notch optics are a must have whenever you are investing in a riflescope, and thankfully the Viper HS-T excels in this area. The scope has XR fully multi-coated lenses, which work to optimize light transmissions for improved visibility. The multiple layers of coatings also have anti-reflective properties, so that you do not experience glare on air-to-glass surfaces. Additionally, the glass of the lens has extra-low dispersion properties, so that color fidelity and resolution are increased. You can therefore expect to view sharp and crisp images at all times. The side focus adjustments found on this scope also allow you to acheive perfect image focus, as well as parallax removal as you shoot. The Vortex Viper HS-T is made using a single-piece 30mm tube, which has been constructed from aircraft-grade aluminum. This construction amplifies strength and rigidity, and also improves the precision and visual performance you will get from the scope. Furthermore, the shockproof scope can withstand impact and recoil, and its hard anodized exterior has low-glare finishing so that you can be completely camouflaged as you shoot. This is complemented by the ultra-hard Armor Tek coating, which protects the exterior of your lenses from dirt, scratches, and oil. Still on the topic of construction, the Viper HS-T is both waterproof and fogproof. The waterproof abilities come courtesy of O-ring seals, which stop moisture, debris, and dust from making there way into the scope. Argon gas purging also eliminates internal fogging at all temperatures, so that your view is never obstructed. The Vortex Viper scope also has an admirable internal mechanism design, which promotes accuracy and improved performance in all conditions. The Customizable Rotational Stop (CRS) allows you to return to zero once you have made your elevation correction, while the Precision-Force Spring System encourages easy adjustments and maximum repeatability. You can also make use of the Precision-Glide Erector System to achieve consistently smooth magnification adjustments. Vortex is big on convenience, and that is why theViper HS-T has many features that make your time shooting and hunting easier and more enjoyable. First off we have a MAG-view fiber optic for visible magnification reference points, and a radius bar that gives you visible and tactile reference points for your turret rotations. Due to the exposed design of the tactical-style turrets, adjusting elevation and windage is quick and precise. The scope also has a fast focus eyepiece for swift and simple reticle focusing. Q:Does the Vortex Viper come with a sunshade? A:Yes. This riflescope has a 4 inch sunshade which protects your lens from the glare of the sun. Q:Is this a first focal plane reticle? A:No it is not, the Viper HS-T is a second focal plane reticle. The listed reticle subtensions of this scope work to estimate range values, in addition to holdover & wind drift correction. You can rest assured that the estimated values you get are highly accurate, regardless of the magnification. The Viper HS-T is the perfect riflescope for your hunting, shooting, and tactical operations. 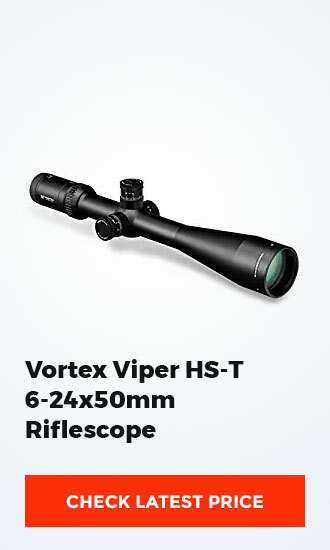 If you are looking for an all-round scope that will excel with medium to long range targets in different settings, then the Vortex Viper HS-T will not let you down.